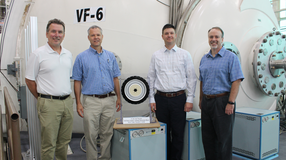 NASA Glenn Research Center’s Hall Effect Thruster (HET) Life Extension Invention received Honorable Mention for the NASA Invention of the Year. Invented by Vantage Partners (VPL) employee Dr. Peter Peterson and four of his colleagues, this technology greatly prolongs the operational lifetime of the HET space propulsion engine. The novel design uses magnetic shielding to prevent the ionized xenon plasma that propels the HET from damaging the walls of the ceramic discharge channel where the plasma is accelerated. With this innovation, NASA can take advantage of the energy savings that come from the HET’s solar electric propulsion system (which offers ten times the fuel efficiency of chemical systems) to undertake such ambitious missions as the Journey to Mars. Also receiving the NASA Glenn Research Center Invention of the Year Honorable Mention is the Schottky Diode Hydrogen and Hydrocarbon Gas Sensor Team. Their sensor can measure hydrogen and hydrocarbon species with high sensitivity and selectivity, while operating effectively even at very high temperatures (up to 600 degrees C). NASA Glenn innovators Gary Hunter (GRC), Dorothy Lukco (Vantage Partners), and Jennifer Xu (GRC) have combined newly developed silicon carbide (SiC) materials with Schottky diode sensing technology to create a sensor that directly measures the presence of targeted gases, rather than using a combination of pattern recognition and different cross-sensitive sensors. This ability to measure chemical species directly gives the SiC Schottky diode sensor uniquely high sensitivity and selectivity compared to other sensors. Furthermore, the sensor’s minimal power consumption as well as its small size and weight make it easy to implement in existing systems without requiring significant adaptations. All of these advantages make this technology extraordinarily useful, not only for space-related applications such as atmospheric characterization on Venus and the detection of launch pad fuel leaks, but also for more commercial uses such as monitoring cabin air quality aboard aircraft, enhancing industrial sensing systems, and providing real-time methane detection for firefighters and other first responders. 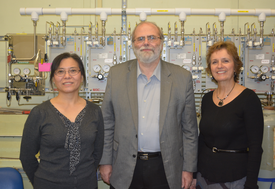 Schottky Diode Hydrogen and Hydrocarbon Gas Sensor Team: Jennifer Xu (GRC), Gary Hunter (GRC), and Dorothy Lukco (VPL).